Athletes First mourns the loss of a family member with the passing of Carolyn Orton on Tuesday, February 10th, 2009 from complications of Lupus an autoimmune disorder. Carolyn, the mother of Terrence Crawford, former Oklahoma State player and Daniel Orton, current player at Bishop McGuinness High School and loving wife of Larry Orton (Big O), will be deeply missed by all. She will forever be remembered for her love and kindness towards all the kids in the program and her willingness to give of her herself to everyone. God has called her home but her kindred spirit will live on. EBoss Hoops to cover event!! Thanks to hard work and his visibility on the recruiting trail, Eric Bossi has earned his reputation as one of the top independent talent evaluators in the country. The founder and director of EBoss Hoops Scouting Service a high school scouting service for Division One basketball programs, Bossi has clients across the country in conferences like the ACC, Atlantic 10, Big 12, Big 10, Big East, Horizon, Missouri Valley, Pac 10, Sun Belt, West Coast, and Mountain West among others. A member of the United States Basketball Writer's Association, Bossi has done freelance work for many of the top outlets devoted to covering high school basketball. He's served as a Senior Recruiting Analyst for highly regarded PrepStars.com and it's partner magazine the Recruiter's Handbook for seven years. Currently, Bossi provides evaluations and content for several sites on the scout.com network. 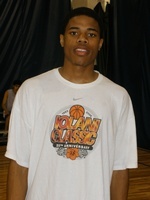 He has also served as a talent evaluator for the prestigious Nike Hoop Jamboree for each of the last two summers. Over the weekend, Athlete's First held their first ever exposure combine. 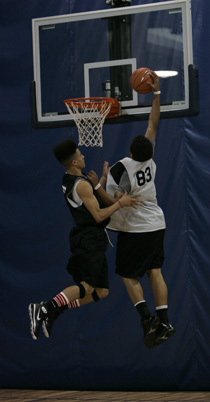 Scout.com was on hand to check out the action and get a look at some of the young talent. When it comes to producing college and even NBA talent, Gary Vick's Athlete's First program has emerged as the top grassroots outfit in the state of Oklahoma. Continually producing top talent, the program took another step over the weekend holding an exposure combine at their new basketball facility in Oklahoma City. Darnell Jackson teaching young campers the proper shooting technique. Darnell Jackson teaching Matt Christinsen the proper block technique. 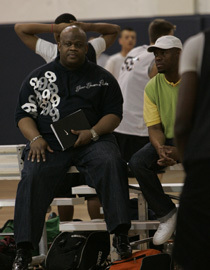 Vince Baldwin evaluates the talent at the 2009 Nike Combine. 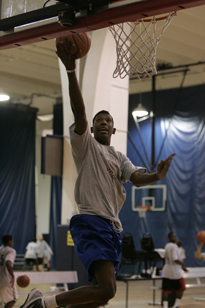 Players play above the rim at the 2009 Nike Combine. 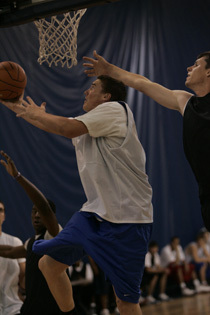 Brings the ball up court during the 2009 Showcase. Lays one in at the 2009 Showcase. ATHLETES FIRST FALL SHOWCASE IS A MAJOR SUCCESS! On Saturday and Sunday, October 23-24, the Athletes First Fall Showcase was held at the Performance Sports Complex in North Oklahoma City. The event was designed to be a fundamental two day session which served as a lead-in to Junior High and High School basketball practices. The event was a "no frills, fundamental, skills and drills camp". The Junior High segment of the camp ended each day with some live game action scrimmages. The High School session ended each day with full court drills of ballhandling,passing, and shooting. The High School group was directed by Carl Henry, the Head Coach of the National Champion, Athletes First AAU program. The players spent eight hours each day on the court going through every kind of fundamental drill one could imagine. It was a great opportunity for many of these kids to not only get a real jumpstart on many of their competitors, but also improve their skill level. The Showcase attracted players from throughout the State of Oklahoma. The talent level was certainly solid, in both the High School and Junior High divisions. Juwan Parker 6'4" 185 FREHSMAN Tulsa, Booker T. Washington Has a High-Major Chance and Future A great body for a young kid. 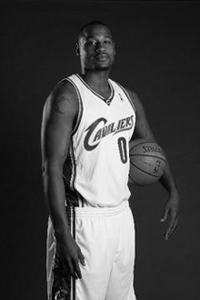 Runs well, shoots it on pull-up and strokes the 3. Great wrist action on shot. Handles well, showed possible PG skill level. A tremendous talent for age. 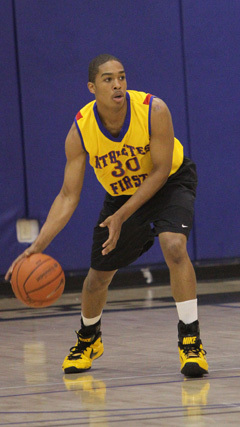 Could become one of the Nation's best in class of 2013. Runs well for a big kid. Is willing to throw body around and play a power post game. Showed some handles and ball skill. A run and jump athlete, quick jump off floor, good looking stroke and shot. A good talent level. Needs additional RPM'S in motor. Sean Young 6'10" 195 SOPH Bixby D-I Potential and Chance. Long, lean, and thin. Runs OK. Hands appeared OK. Looks young. Future depends on development, weight/strength and overall development of a true position. Is a project, but due to size and youth has a very high ceiling. Showed some good handles, good skill level, and a good feel for the game. Good strong and athletic body, good handles and speed. Plays aggressively and comes at you. Shoots it, moves well without the ball, decent feel for the game for a young kid. Long and athletic, decent skill level. One to keep an eye on. *Note: Rick McCormick is a veteran college basketball coach of 27 years. McCormick was a College Head Coach and Athletic Director for 17 years. Along with winning a National Championship, he was named National Coach of the Year and was selected as Conference Coach of the Year in three different collegiate conferences. Known as an excellent evaluator, he brings the uniqueness of having coached collegiately at the Junior College, NAIA, NCAA D-II, and NCAA D-I levels. His website is www.southwesthoops.com.